The web browser is another key app as far as tablets are concerned. There is full Flash 11 support and tabbed browsing. The tabs are kept in a bar on top, much like on a desktop browser. 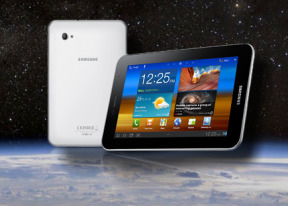 The address bar and search bar are incorporated in a single field - typical Android - which scores another point for the Galaxy Tab 7.0 Plus. Now, for the Flash performance – the Galaxy Tab 7.0 Plus does great at 360p, 480p and 720p videos right in the browser. Flash games go well too. A good set of organizer apps are available on the Samsung Galaxy Tab 7.0 Plus, including the Polaris Office that can both view and edit documents. It has really nice user interface with 3D arcs for the recent docs, internal file browser, intuitive interface, etc. It supports both internal and web storage (via Box.net).